Back in the day, I attended Brigham Young University. One of the most popular items at the campus cafeteria were these mint brownies. Besides bringing back lots of good memories, they’re perfect for St. Patrick’s Day, with their minty green layer of frosting. Traditionally, the top layer is chocolate frosting, but I figured they would only be improved with ganache. Any way you top them, the combination of chocolate and mint is always a crowd favorite. To make the brownies, melt the butter in the microwave in a large glass bowl. Stir in cocoa until smooth; allow to cool. When butter mixture is cool, stir in the honey, eggs, vanilla and sugar. Blend in dry ingredients until well combined. Add walnuts if desired. Pour batter into a greased 9x13 pan and bake for about 25 minutes. Cool. Make mint frosting by mixing together butter, salt, corn syrup and powdered sugar and smooth. Add mint extract and green food coloring. Add milk gradually until consistency is a little thinner than cake frosting. 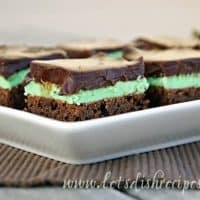 Spread mint frosting over cooled brownies. Refrigerate to set frosting. Meanwhile, make ganache by heating the cream over medium heat until scalding; do not let it boil. Remove from heat and stir in chocolate and corn syrup. Stir until mixture is smooth and shiny. Cool ganache until it is close to room temperature, but still pourable. Pour ganache over mint frosting layer and spread evenly. Return brownies to refrigerate to set ganache. Cut into squares, wiping your knife clean after each cut. ooo…wow… I can hear them calling my name…. Made these. Love these. YUM! I also made that decadent brownie pie of yours for Valentine’s Day-Delish! Couldn’t stop eating it. 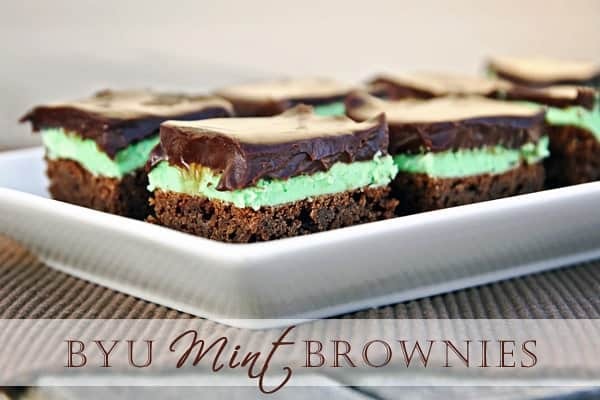 I’m partial to chocolate and mint…these brownies look wonderful! Ooh I love the bright green frosting!! Oh my yum, yum, yum! Looks absolutely delicious! Now if I could just find the BYU Cherry Chews from ” back in the day”. Oooh, I’ve never heard of those. I’ll have to look into that! You might want to change the mint recipe so that the first ingredient (butter) is listed with the others instead of in the heading. Took me a while to figure out. Thanks for sharing this recipe! How much chocolate is in the ganache? You just have cream and corn syrup listed. I’m thinking of making these in a baking sheet. Maybe just double the recipe? Oops! It was actually there, but the formatting on the recipe card got messed up. (that has happened with some of older recipes when I make design changes). The chocolate amount was squished up with the “Chocolate Ganache” heading, rather than in the ingredient list. I fixed the formatting, so you should be able to see it now. It was 12 oz. And yes, if it’s one of those big baking sheets, I think you could double it. You can always make an additional smaller pan if it doesn’t all fit.